Description: Grapes are thornless vines that have tendrils. The Wild Grape has a greenish flower. 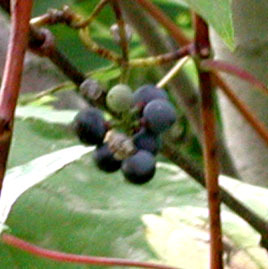 The actual fruit, the grape, is purple, black, or amber, and has 1-4 pear-shaped seeds per grape. The fruit grows in late summer to fall. 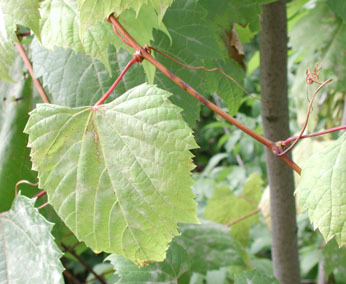 Leaves: Grape leaves are large, green, lobed, and coarsely toothed. Habitat: This vine grows in thickets and at the edges of woods. Location: One Wild Grape that I saw was growing on the hill along the stairs from T-lot to the top of Spingold. Use: The grape can be eaten raw, but the wild grape will not be as sweet as a grocery store grape. It can also be made into a jelly and a cold drink. The young grape leaves can be boiled for 10-15 minutes for a cooked green, or, as more famously used, can wrap rice or meat for baking. Collect the leaves in early summer and the fruit in the fall.